When my kids were small I was a full time student. I rushed them to childcare, attended classes all day with care-free twenty-somethings, picked up my kiddos, raced home and then stuffed them with five minutes meals. Bath time was followed by bedtime and all the while I scolded hurry, hurry, hurry! I studied all night, and after a few hours of sleep dragged myself out of bed, and poured milk with my eyes closed into waiting bowls of cheerios. Enjoying the moment seemed an impossible goal as my brain was always calculating hours of study versus hours of sleep. No matter how I tried, I could never get enough of either. In those early years of parenting, functioning in a state of exhaustion seemed to be a way of life. When I finally graduated with a degree in Accounting at twenty-three, my children were just five and four years old. A few years later, I was a single mom with a full-time job and I continued to rush my children through their childhood as I raced through my life, creating a list of achievements that didn’t include Mother of the Year. It seems I got the memo saying, You can have it all. But, I missed the follow up . . . You just can’t have it all at once. I can only hope that my children know I did the best I could with what I had. I cannot go back in time, and I won’t let regret shape my future. So, I take the lessons learned and share them with my grandson. When I spend time with him, I let him rule the day. As a quiet observer, I follow his lead, as he experiences the world , his way, at his pace. I marvel as he marvels at spiders, and pincher bugs. He tells me, they are good and the pincher bug is my friend because I am a boy, and it only does soft pinches. He is fascinated with trash trucks. He insists we clean up trash. We walk the alleys of my neighborhood. He wants to know where to put the trash he collects. I tell him green cans for plants, blue for recycle and brown for trash. He tells me, mommy says I am a big helper. For each piece of trash he gathers he announces which color bin he will use. Looking for reassurance, he asks me, All the people will be happy that I am cleaning all the trash? I tell him, yes they will be so happy. He says again, I am a big helper. I tell him that he is helping our world and he repeats my words proudly, I am helping our world. We continue scouring the alleys for trash. 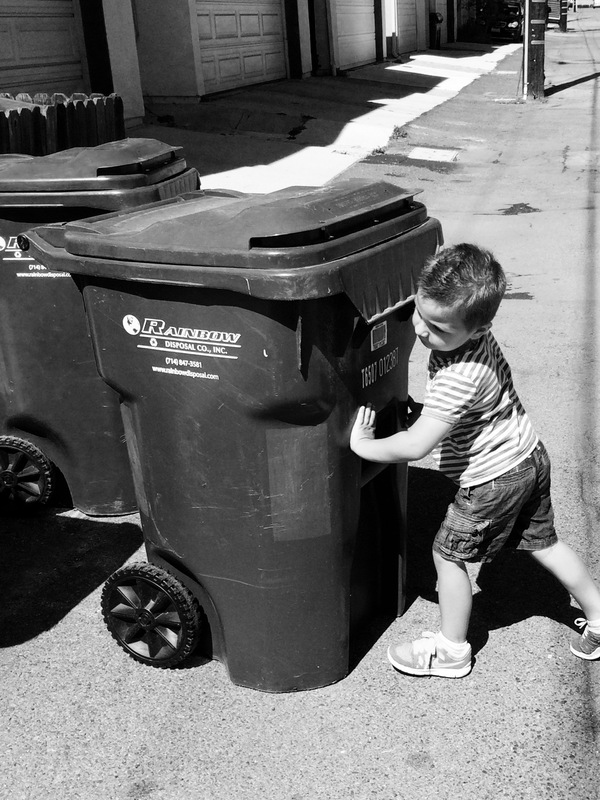 Feeling bolder, now my grandson is moving the bins, opening the large lids and allowing them to bang loudly against the outside of the can. He throws in his bits of trash and using all his strength he flips the lid to close the can again, and pushes it back in its place. This is hard work for a little guy, but he doesn’t ask for help and I allow him to struggle . . . and he is so proud of his accomplishment, I am good trash helper Nonna. Mommy says I am strong helper. His chubby little hands are filthy and I ask, What do we always do after we pick up trash? He proudly says, Wash our hands. Looking down at his hands he smiles and says, my hands are filfy. Our pace is slow, we are in no hurry, and I find myself wishing so badly that I knew then what I know now. Remembering every time someone looked at me and my children longingly and said, Cherish these moments, the years fly by, enjoy the simple things, I can only sigh. I didn’t connect those words to me or my life in any way. I thought it was just polite chatter offered by old people. I wish someone would have grabbed me by the shoulders, given me a good shake and screamed LISTEN!! Today I am listening. I listen happily to my grandson’s funny words and his mispronunciations. I answer his questions, and sometimes say, You tell me the answer, and he does. I want him to believe he is important and that what he does is important. I show him what I believe with the way I behave because he is watching me; I didn’t realize how closely until today. He turned to look at me, cocked his little head and asked, why are you smiling on your face Nonna? Until that moment, I didn’t know I was wearing a smile, but instantly I answered, Because you are here with me, and I love you. I kissed his little lips and he smiled too. That was beautiful, and so true. Your last line said it all. Wonderful piece. Thanks for the reminder, my friend! These are words of wisdom for those of us in the “hurry, hurry” chapter of life. I love your blog! I really loved and so related to this one, thank you! I call those early years The Baby Daze. I wasn’t going to school, and I didn’t always work, but when I had my babies, I was already raising two kids. Like you experienced, my days seemed filled with a haze over carpools, diapers, homework, cooking, and cleaning. Around the youngest’s third birthday, the light at the end of the tunnel appeared. I can’t go back, I can’t regret, but life is much more enjoyable now. How precious it is to take the time to really enjoy one another. Spending time with the people I love is the absolute best. Taking life much slower these days. Love your stories. Love your writing. One thing that I love to do with kids of all ages is to ask them what their favorite thing to do with each person in their life. I really love doing this in front of their parent, nana, auntie…( the person that they are talking about). It is surprising what they most enjoy. Our only neice/nephew on Basil’s side stayed with us off and on when she was 7yrs old. She told me that her favorite thing to do with me was going to the beach and garage sales. Her Uncle Basil it was “science things”. What I noticed is that they had different favorite things for each person. Basil and I have always been into giving our time rather than buying things. Another honest and true blog. I was doing the same thing-college, children, single, job, and so on and so on….. I am blessed to be able to stay home with my kids and because they are all a year apart from one another in age, it gives me more “free” time to do things like blogging. 😀 But there are times that I just have to tell myself that I need to be a part of their tiny little lives at certain moments because I will never get a chance at those moments again….sometimes however they don’t want anything to do with mommy in “their” make believe world. Lucky you :-). Isn’t it awesome to just observe their little worlds. I am so lucky to have this chance as a grandparent. thanks for stopping by to read my story. I think about this all the time. My boys are growing so fast. I get to stay homeschool, but time still seems to be passing by very quickly. Wonderful piece. I found your link on suzyspeaks- I’m so glad I did. A friend and neighbor–a relatively recent convert to grandmotherhood–told me the other day that being a grandmother fills a hole in your life that you never knew was there. I stopped by from Suzie’s Birthday Blog Bash. Hi! Wonderful words. I am hugely guilty of rushing my little boy but your post has really made me think about this and I hope I will begin to address it. Thank you for this wisdom. Hey! I found your blog on Suzie’s party blog! I like your encouragement for your own children. I also believe that it is wonderful how you had a full time job while raising them and you have your degree too. That’s a tough task. I hope they learn from you :). I’m trying not to live in the past because it makes me sad but as I try to create my future alone, I often want it all back.. and I want to do it all differently. I know I did everything to the best of my ability and with the greatest intentions at the time and that includes being a Mother of four and struggling to leave an abusive relationship. But in many ways I feel I’ve been robbed..
It’s written for young readers- some of my favorite books to read. You’ll love it. Saw the movie as well with some one who robbed my heart. I loved the story so much I wanted to share it with him. Beautiful story! I have the same thoughts all the time – I wish I knew then what I know now… Thank you. Thank you so much for perusing my blog!! I’ve never had a baker pop-in. I checked out your blog. Beautiful food!!!!! I just remodeled my kitchen. And vowed to return to baking and cooking after years of neglecting those skills. Ha-ha! I am not really a baker per se, it is just name a choose ( I love baking and I am passionate about it). Thank you for checking out my profile. I read couple of your stories and really liked it. I love when I work hard to ensure my words reflect how I feel and someone connects. 🙂 thank you. The note about your daughter makes me teary in the best way. Again I so appreciate your visit to my blog. A lovely reminder for this mum who feels like she’s constantly stuck running on a hamster wheel. I will slow down and listen and enjoy more. Glad I found this post via Suzie81’s blog party. Many thanks for this lovely post – your writing style is very enjoyable by the way an the message really does need to be heard. It’s so great that you learned this in time to enjoy your grandson. So many people don’t unfortunately as it’s a fact that there are things we may never learn in our lifetime and which we can’t even begin to know about. I love the way this closes. Beautiful! I loved this one!!! Serious words to live by!!! This is an awesome post. I was a single mom and worked part time. I know the hurry, hurry you talk about. Time slipped away too fast, like a runaway train. At last I relaxed when my grandchildren came. I enjoy them more than I had my daughter because life was a blur. Beautiful and so true. Spend so much of our lives trying to achieve things when really our best achievements are our children. and half the time we don’t even appreciate how precious they are and how fleeting their childhood is. That’s seems to be true. Hope I get it right – second time around (not that I want grandkids anytime soon – have a ways to go yet – I hope). Lovely! I can so relate to this now that I am a grandma. I can so relate to this now that I am a grandma and even as a parent as my life started to slow down and realized how much I had missed. You can never get that time back. Lovely post. We should all take time out to listen, watch and enjoy our children. They grow so fast we don’t have long. I just spent the entire weekend rushing my 3 1/2 year old to do anything but “bother” me. Sighs. I’m working on my first novel and the juices were flowing. I needed to catch the words. I didn’t have time to play tea party. I read this with tears streaming down my face. Thank you.